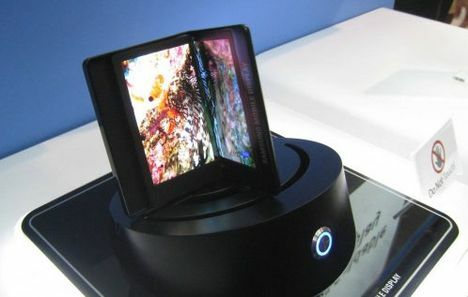 Samsung plans well with the Samsung GT-B9150 Galaxy Q in 2013 to bring his first foldable smartphone on the market. Thus, it suggests at least by the guys from SamMobile. The Samsung Galaxy Q will thereby get a foldable or flexible sAMOLED HD 5.3 inch dual display. The Samsung Galaxy Q is an Android - are Smartphone with 5.3 inch flexible sAMOLED HD Display. Inside, the new Exynos potter 5250, a corresponding leak was already surfaced last week. There are also 2GB of RAM, an 8MP camera on the back and a 2MP front camera. The battery of the Samsung GT-B9150 Galaxy Q will have a capacity of 3.500mAh. Of course there is the Samsung Galaxy Q is also Wi-Fi, NFC and Bluetooth on board. Which version of Android running on your smartphone is unknown. Since Samsugn will begin mass production probably soon, I'm guessing here, then probably on Android 4.2. For if the release is in 2013, should have established this beautiful Android version already. For the Samsung Galaxy S3 release there were rumors that Samsung still wanted to start this year with the production of Android smartphones with flexible displays. Then christened the corresponding smartphone Samsung GALAXY Skin. Most likely, the new Samsung Galaxy Q will probably be this time assumed model.